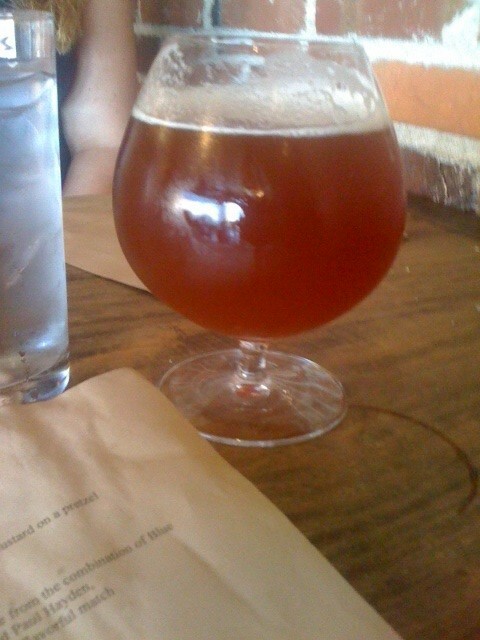 On Saturday, I made my way to Urban Chestnut Brewing Company. A brewery started by former A-B people, to which one of them has over two decades of brewing experience. Luckily, I almost have two decades of brewery drinking experience. Apon arrival into the “quaint” and “charming” (you know, words realtor’s use to describe something that is small) parking lot, I noticed that 3 of the cars had “UCBC” black and white stickers on them. Must be a local beer gang then I wondered “When did this start up?” and “How can I join?”. Clearly, UC in their short year have created a good following of regulars. This hypothesis was proven once I walked inside. Once inside, a friendly hello can be heard from behind the bar. A few regulars were bellied up to the bar and some “passer bys” were seated near the window to catch a glimpse of the midday sun as it lays its rays on the beer garden located out front of the “Brew Pub”. An “Order Here” sign drawn in chalk hangs to the one side of the bar as to greet you on your journey through the Urban Chestnut Land of Beer Enchantment. (That’s a great title I just made up. It should be a board game like Candy Land, but for adults). But beer isn’t they only item they serve here. They also serve a good selection of Bavarian food put together with local ingrediants. The menu consists of G&W meats, some Volpi contributions and some others that were on the list as well but I forgot because well, I had beer. The menu is not big but has enough to fill your gulltet. I stood at the “Order Here” section and selected their meat and cheese platter because sometimes a man just has to graze as he drinks a beer instead of chowing down on a full meal. Then I chose their signature “Winged Nut Ale”. I grabbed the beer and headed for a table. I looked the beer up and down as if we were two strangers trying to get to know each other. The ale has a nice amber/caramel color to it as well as finish. I can clearly see why it is their signature ale. I can also see that I finished my beer way too fast. So I ordered another one. I mean who wouldn’t? 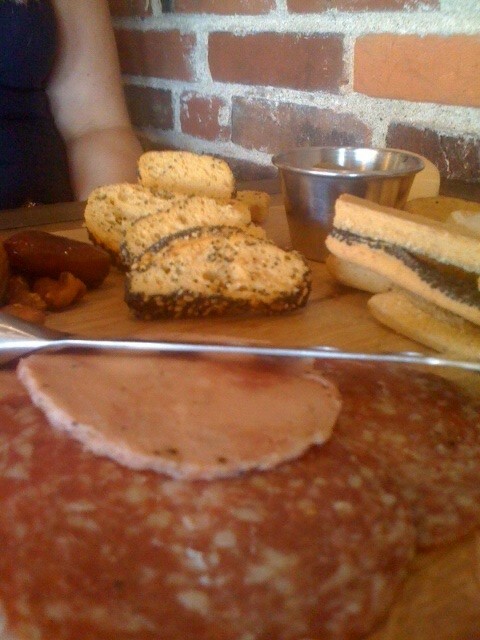 The meat and cheese platter came out and I almost felt like I was at a winery. It has olives, dates, walnuts, various cheeses and local meats on top of a wooden plank. Because food on a wooden plank is like a welcome mat for a guy. It says “Here. Eat this. It will be glorious.”….and it was. Sipping my beer and grazing while enjoying the conversation of Heather (my girl) made a good start for the day. “Good start to the day?” You might have noticed and asked. Yes, I went around 11 and yes I get excited about beer. As we sat there on the side wall observing the crowd, I noticed that there was a steady stream of regulars who would come by with these duffel bags. They would gentily set them down on top of the bar and pull out growler after growler. For those who don’t know what a “growler” is, it’s just a dark glass jug to which you put beer in. Yes, I am sure the women out there are saying “Why not just call them “glass jugs” then?” . Because it’s not as cool and it is the one “term” we guys get to have for an ordinary object. Women have so many like “Duvet”. It’s a damn blanket and you know it, but I digress. Our overall exprience was relaxing and fun. I would definitely go there many more times to sample more beer, more wooden planks and take in the ambience. If you don’t want to go by yourself by all means let me know and I will go with you. Seriously, I will turn my car around where ever I am then join you. So many other people must do this as it’s the only logical explaination why there are so many accidents on 40. I write. I drink. I read. I walk. I breath. I play. I endure. I smile. I observe. I eat. I love. I draw. I create. I resolve. You can follow more of what Adam Hallas does here.